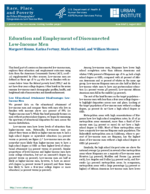 This brief, part of a series on disconnected low-income men, explores their education and employment outcomes using data from the American Community Survey (ACS, 2008–10) supplemented by other sources. Low-income men are defined as those age 18 to 44 who live in families with in-comes below twice the federal poverty level (FPL)1 and do not have four-year college degrees. Other briefs in the series examine low-income men’s demographic profiles, health, and heightened risk of incarceration and disenfranchisement.